Two Sundays ago, Mead Johnson paid for a cover story in the Sunday Inquirer Magazine to feature their "Feeding Hope" program.A couple of days after that feature, our Food and Drug Administration issued 2 advisories recalling Mead Johnson products - Sustagen Junior Milk Drink Powder Vanilla Flavor (for toddlers 1-3 years old) and Alactagrow Bibo Trio Milk Supplement under Advisory Nos. 2010-009 and 2010-010, both issued on on 16 September 2010. Under Advisory No. 2010-009, Sustagen Junior is being recalled because of its non-compliance with the standard fat content level (3-6 grams per 100 calories) for milk supplements. Testing showed that Sustagen Junior's fat content is at 1.5g per 100 calories - clearly at a substandard level. Bibo merely had 1.34g per 100 calories of fat content - also at substandard level. Interestingly though, labels of both products didn't clearly state the fat contents of their products or that they were within the required levels. 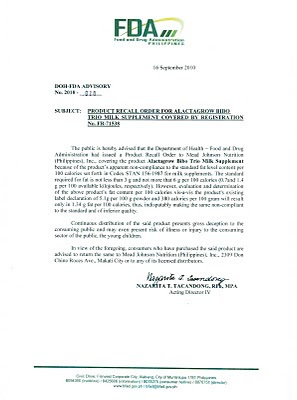 Sustagen's label stated that fat content was at 5.9 g per 100g (392 calories per gram), while that of Alactagrow Bibo was at 5.1g per 100 g (380 calories per gram). The average consumer wouldn't really understand if this is within the required level as stated by the FDA. 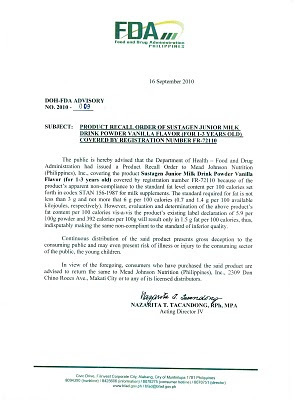 However, the 2 advisories clearly stated that upon testing, fat levels of the 2 products are non-compliant with the standard level of quality. This morning, the Mead Johnson representative, who was being interviewed in the morning news, kept harping on (1) how this was a 3rd class recall; (2) the recall shouldn't have been made public and that they were caught by surprise; and (3) their products passed all the minimum standards. I wouldn't be surprised on how Mead Johnson will deal with this recall given their underhanded marketing tactics to undermine breastfeeding efforts and implicitly (sometimes not even!) influencing mothers to think formula milk is as equal to breastmilk and to choose that instead! If you have purchased these 2 recalled products, better contact Mead Johnson to return then. Consumers of these products are children from 1-3 years old and can actually just choose to drink fresh milk instead. Read THIS POST on why formula milk is not necessary for toddlers.